Are you ready to become a Myofascial Yoga teacher? Myofascial Yoga institute of Canada offers a 200 and 300 hour Yoga Alliance registered teacher training program. The 200-hour program covers the basic foundational teachings of yoga, with some important upgrades from the field of fascia research and mindfulness-based somatic therapies. Having practiced for over twenty years in the fields of Myofascial Release therapy, Hakomi, Reiki and Yoga, I can offer you not only the wisdom of my experience, but also a deeper insight and awareness into your own experience. Yoga is a time-tested healing modality dating back more than 8000 years, and the John F. Barnes’ Myofascial Release Approach® is considered to be the ultimate therapy for healing all aspects of a person. Myofascial Yoga combines these two along with the latest scientific evidence from the world of fascia research in order to create a well-rounded course that will complement your current practice and add new skills to your classes and workshops. You will find this training is a wonderful blend of ancient wisdom and the latest scientific research. If you are interested in biomechanics, mindfulness, fascia, anatomy, energy medicine, trauma theory or even just deepening your yoga practice, this training is definitely for you! If you don’t yet have a practice and are new to this field, don’t fret- this course will help inspire within you the confidence and ability to become a successful yoga teacher! This program is a Yoga Alliance (USA) accredited Teacher Training Program. You can attend all 200 hours for a basic level certification (Advanced level coming soon!) or take single modules for your continuing Education credits with Yoga Alliance. ~ Experience of mindfulness within yoga poses. Our intention is that this program will not only benefit your personal yoga practice, but change the lives of your students, as well. We look forward to seeing you, fierce and fresh and ready to learn!! The 300 hour program will start where the 200 hour left off. Trauma-informed Myofascial Yoga. Biomechanics-based mindful movement, fascia anatomy, neuroscience with the latest additions of pandiculation, biotensegrity and somatics with mindful strengthening. The first module is May 12-17 and I’m thrilled to announce Joanne Avison as our guest teacher to introduce the principles of biotensegrity. “Before representing an important upgrade and update of my abilities, this course has been a journey to discover a new part of myself. I came all the way from Italy because I was attracted by its innovative approach, and it clearly confirmed that Myofascial teaching is the right path for me. Christine was able to show me how the practice of Myofascial Yoga is a powerful tool to make friendship with the body and help it process every trauma, both at the physical and emotional level. I learned how important listening to body needs is, recognizing any and all tensions in the fascial system and releasing them, being gently guided in each pose without forcing. The human body and its alignments, poses and their adjustments, group dynamics, yoga meditation are just some of the topics covered in the course. It is, in fact, a perfect set of practical lessons, video insights, and written material, and it comes with all the support and suggestions needed to teach consciously, and to create a space where the teacher’s and student’s needs are met. The amazing combination of abilities and knowledge Christine has gathered through 25 years of Yoga practices, as a Reiki master, healer and body worker, coupled with a very extensive familiarity with spiritual research, Hakomi therapy, and Myofascial Release, made this course a blessing. 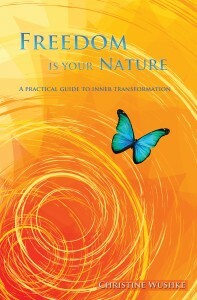 Christine Wushke began her yoga teaching career in 1997, and is now the author of Freedom is Your Nature: A Practical Guide to Transformation and creator of the “Easy Yoga for Beginners” DVD. A long time Yoga Teacher, Meditation Instructor, Myofascial Release Therapist, and Certified Hakomi Practitioner, Christine decided to merge her specialties. She began to incorporate the principles of Myofascial Release and Mindfulness into all her yoga classes and, noticing the amazing results and effectiveness, she designed her own system of Myofascial Yoga. In this practice, she blends the profound principles of Myofascial Release with the mindfulness of Hakomi and the biomechanics of movement, all while keeping intact the essence of Yoga as an 8-fold transformative path and holistic healing system. Christine is committed to bringing you the latest information from not only the world of fascia research but also the science of the brain and nervous system, and all while offering the opportunity for you to go inward and discover the benefits directly for yourself. Her aim is to create a sacred space for students to effortlessly find the presence of stillness and an inner silence. Her mission is to raise consciousness on the planet by empowering people to realize their own Divinity and to uncover a deep peace within. She runs the Journey to Light Wellness Center in Canada and regularly conducts Myofascial Yoga retreats in the Rocky Mountains and Hawaii. In addition to yoga classes and retreats, she is also a registered massage therapist specializing in both John Barnes Myofascial Release and Hakomi. *Disclaimer: The yoga therapy components of Myofascial yoga are based on my expertise as a Myofascial Release Therapist and RMT, and are not derived from our status as a RYS with Yoga Alliance Registry.